INDIANAPOLIS (July 23, 2014) — Klipsch, a leading global speaker and headphone manufacturer, announces today the launch of a new Reference Series that includes six passive home theater speakers and two subwoofers. The Klipsch Reference line joins the renowned Reference II Series that is currently in the market and offers similar advanced acoustic engineering and industrial design. These products represent the initial and entry-level series in what will be a tiered approach to Reference home theater speakers to be completed in 2015. 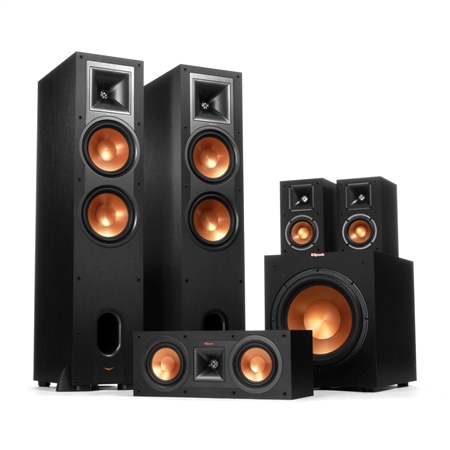 Klipsch Reference consists of two floorstanding towers (R-28F and R-26F), two monitors (R-15M and R-14M), one center channel (R-25C), and one surround (R-14S). The line’s subwoofers include the R-10SW and R-12SW. All of the Klipsch Reference loudspeakers are available in a brushed black polymer veneer finish and equipped with exclusive Tractrix® Horn technology and Linear Travel Suspension (LTS) aluminum tweeters that produce impressive high-end response and powerful dynamics for clean, natural sound. Their LTS tweeters have been a hallmark in the previous Reference generations as well as the flagship Palladium Series and ensures minimized distortion for enhanced, detailed performance. Providing remarkable low-frequency response with minimal cone breakup and distortion are the speakers’ Injection Molded Graphite woofers. The Klipsch Reference subwoofers are also available in a black polymer veneer finish and feature high performance, front-firing drivers that provide deep bass and placement flexibility. Their Injection Molded Graphite woofers are exceptionally light while being extremely rigid to provide remarkable low-frequency response with minimal cone breakup and distortion. The built-in all-digital amplifier also delivers ample power with high efficiency and true-to-source accuracy in reproduction. Klipsch Reference covers U.S. MSRP price points ranging from $698 to $898 for a pair of floorstanding speakers, $199 to $249 for a pair of monitors, $249 for a center channel, $279 for a pair of surrounds, and $349 to $449 for a subwoofer. The Reference Unity strategy is a global initiative that will align the majority of its product offerings under the legendary Klipsch Reference Series. The new approach unifies the speaker, soundbar and headphone series, making its superior sonic signature attainable to a wider audience at various price points. These tiered levels of home theater speakers, soundbars and headphones are precision-engineered and meet the brand’s high-quality acoustic and design standards. The Klipsch Reference Series speakers and subwoofers are now available for purchase at authorized retailers and Klipsch.com.